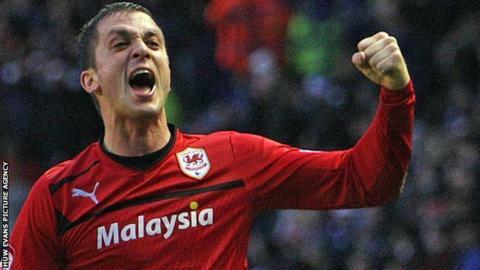 Andrew Taylor says Cardiff City still have plenty of work ahead if they are to secure promotion to the Premier League. "We know as a group of lads that there's still a long way to go and we've got to remain focused," he said. "I always say the same thing, nothing's certain in football. There's still 16 games to go. That's a lot of points to be played for. "Yes, we're in a great position but it can soon change and it's down to us to make sure it doesn't." "But we've given ourselves a fantastic opportunity." Former Middlesbrough defender Taylor admits Saturday's home game against Bristol City will be a tough encounter despite the opposition's lowly league position. Sean O'Driscoll's side are second from bottom in the Championship but have won three of their last four league matches. And Taylor pointed to Cardiff's only home loss of the season so far, a 2-1 defeat to strugglers Peterborough in December, as a warning to his team. "They're down the other end battling for their life," the 26-year-old added. "As much as we're fighting and wanting to get to the Premier League they're fighting and scrapping not to end up in League One. "It's going to be a difficult game. As we've seen against Peterborough no game is easy in this league. "We'll have to go into the game with the right mentality and hopefully come out winners."